As far as back as 1876, with annual exceptions, the Easter Egg Roll event has been held at the White House in the United States of America. The event itself involves a race in which children each wield a long-handled spoon to be used to roll eggs on the South Lawn. This Monday, the event will once again be held at the White House and Nintendo will be partnering with the National Park Foundation, a charity organization which supports America's National Parks. By partnering with the National Park Foundation for the event, Nintendo will also attend the Egg Roll itself in order to help fulfill this year's theme of "Hop into Healthy, Swing into Shape." The theme itself is meant to encourage children and families to live more active and, furthermore, healthier lifestyles. With this theme in mind, it seems appropriate that Nintendo will be bringing Wii Fit U and Wii Sports Club to the event. Visitors of the event will have access to the aforementioned games via kiosks which will be located on the Ellipse, located just south of the White House. Additionally, Mario and Luigi costumed characters will be located on-site of the event to entertain the visitors, pose in fans' photos, and encourage children and adults alike as they participate in the activities of the day. Perhaps additional characters and other activities will also be utilized at the event as surprises for the crowds. Most would think that seeing as this event is an Egg Roll with Nintendo playing a part, Yoshi-themed eggs would be used as opposed to traditionally decorated Easter Eggs. Thus far, there have been no confirmations of Yoshi making an appearance at the event or of such eggs being used. Actually, the eggs used in the Egg Roll are those produced by the National Park Foundation from hardwood. Although as strange as this may seem, the idea of children crushing real eggs on the lawns of the White House does not seem like the best idea out there. 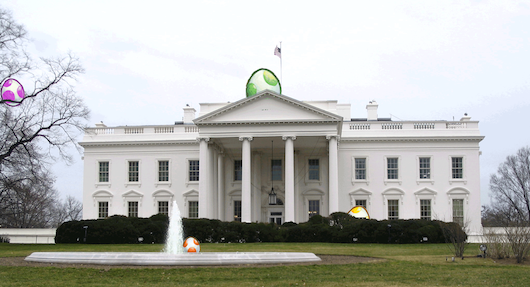 Even though Yoshi's eggs will not be used at the White House, as far as we know, Nintendo will still be playing its part in helping fulfill the theme of the event by its own participation. The whole event supports the First Lady's (Michelle Obama) Let's Move! initiative which seeks to combat childhood obesity by encouraging healthy lifestyles so children have the opportunity for their full potential. Even though I see this event in-part as a big missed-opportunity for a Yoshi Easter Egg Hunt, the Easter Egg Roll seems to be a good opportunity for family fun and it has good motives behind it. It is nice to see Nintendo in the limelight in this respect; participating in Nationally-covered festivities. Perhaps in the future, other big-names in the gaming industry will seek to sponsor public affairs and celebrations. Whether you are a few blocks from the White House, states away, a national borderline away, an ocean away, or anywhere around the world, Happy Easter my fellow Sinners! I hope whatever traditions, activities, and post-activities you plan on celebrating this time of year go eggcelently!